Kenny, a paralyzed dog in danger of euthanization, was rescued and helped to walk again by the Los Angeles canine wellness center Two Hands Four Paws. See the inspiring video. The Bill Foundation created this powerfully affecting video about Kenny, a paralyzed dog in danger of euthanization who was rescued and helped to walk again by the Los Angeles canine wellness center Two Hands Four Paws. 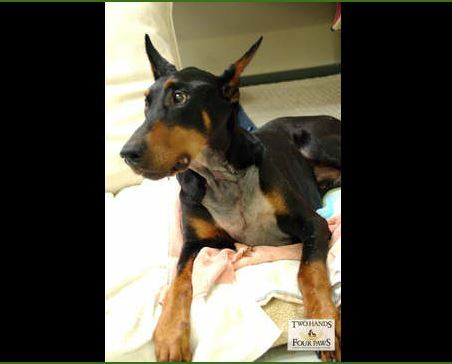 In April of 2013, the founder of Dobie Rescue discovered Kenny paralyzed in his kennel. He was an owner surrender at 2 years old because he “wasn’t aggressive” enough. His owner felt that he hadn’t defended himself from an attack by another of the owner’s dogs. At 2 years of age, he was deemed too old to be adopted, so he then spent the next 3 years of his life in a cage. Because there wasn’t enough money for a full diagnosis, and he was a seemingly hopeless case, the recommendation was to kill him. That is where Two Hands Four Paws stepped in. They utilized their network of veterinarians, specialists, and physical therapists to help Kenny get back on his feet and prepare him to be ready for a forever home. Kenny has been miraculously transformed, is walking again, and is now looking for his forever home. See more about Kenny at Two Hands Four Paws at Facebook. See more of Kenny’s rehabilitation and recovery videos at the Two Hands Four Paws YouTube channel. 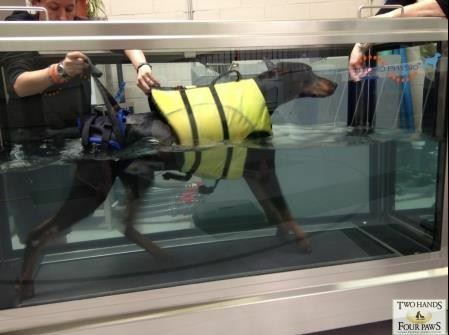 May 2013 – Two Hands Four Paws video, Kenny – Walkin’: Kenny continues his recovery. Two weeks after surgery he’s loving his refound mobility. August 2013 – Two Hands Four Paws video, Kenny – Stayin’ Alive: It’s time for more advanced exercises for Kenny. Tech Jessy takes him through his paces. Cue the Bee Gees! Our boy has got moves! Dog “Earns” MBA, but Is His Degree Real? Hello. I was wondering if Kenny is up for adoption. Kenny is up for adoption. You can fill out an application at Bill Foundation website. This is amazing. What caused his paralysis in the first place? We adopted two dobermans about three years ago. They were both old. When we arrived to pick them up we found the male was unable to walk. I don’t know how long he had been like that but he was very thin and his muscles were atrophied. We decided we couldn’t leave him on his own because we knew what would happen so we took them both home. I bought him a ‘Ruffwear’ support harness and although he was 12 years old we started to encourage him to walk again. We fed him up and he started to put on weight. The vet said he suspected Wobblers disease and didn’t hold out much hope. Three weeks later I came home from town one day to find his bed in the kitchen empty! I went looking for my husband to see where he had put him. BUT instead there was Pacha, WALKING down the garden so pleased to see me and so pleased with himself to be out on his own. He continued to make progress and although he was very wobbly with his Wobblers Disease, he was pain free and lived another 12 months before his kidneys failed. The power of love and devotion will so often overcome insurmountable odds. Darn those onions ..(tears of joy !! ) i laughed when i saw him all well and happy to be able to run like a normal doggy..this is awesome !! I really love beautiful story with happy endings like this.. great job you guys who helped Kenny …god bless you all . THANK YOU! !